The Union meets about every three years. Each meeting is in a different location in the world. 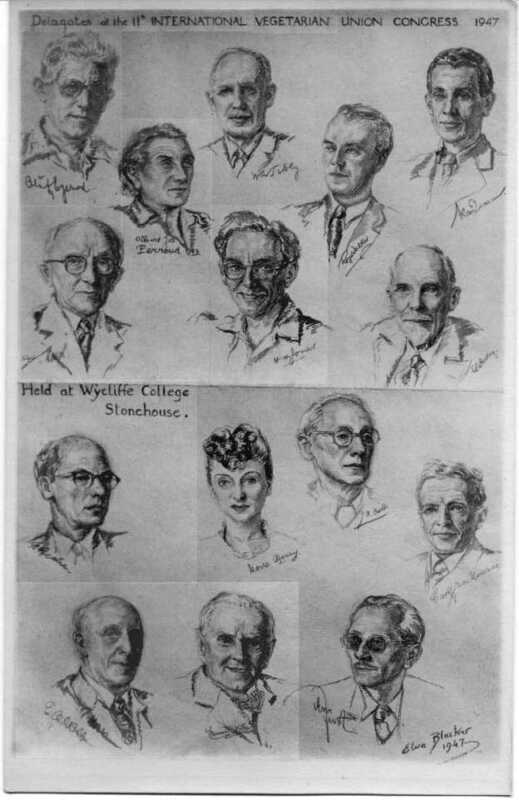 In 1947 the 11th International Vegetarian Union Congress took place at Wycliffe College in Stonehouse, England. Earnest Albert Webbe, depicted in the lower left corner, attended the meeting as a delegate. Back row: Mr K.J.Mellbye, Mr J.Pedersen, Mr E.Just, Mr S.A.Hurren, Mr C.Mallalieu, Mr S.Taylor, Mr Kaj Dessau, Mr W.Shrigley, Mrs Elsie Shrigley, Mr E.T.Smith, Mr T.F.Rawls, Mrs T.F.Rawls, Mr A.Millwood, Mr Are Waerland, Mr D.Slater, Mr N.Neilson, Mr G.Hedfors, Mrs S.Healey, Mr G.van Nederveen. 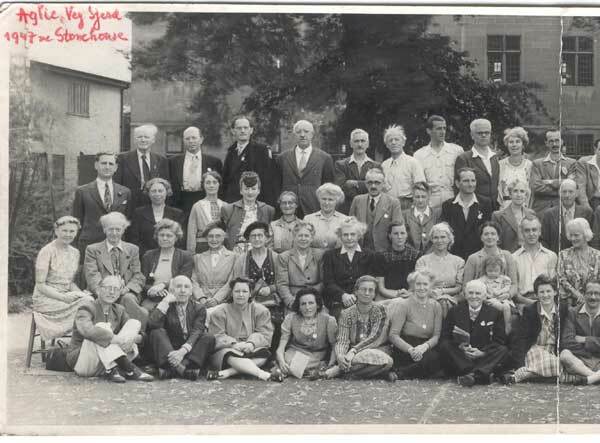 Third row: Mr I.H.Sercombe, Miss I.Gibbs, Mrs E.G.Griffiths, Miss Moira Henry, Miss Mia Cram, Mrs A.Pugh, Mr G.R.Axon, Mrs C.Mallalieu, Mr J.Stevens, Miss F.M.C.Bradfield, Mr D'Arcy Denny, Mr A.J.Perroud, Mrs J.H.Bolt, Mr H.H.Jones, Mrs Howell Ritson, Mr Howell Ritson, Miss R.J.Beunning, Mr M.Karlson, Mr C.J.Hansen, Mr C.Schelin, Mr W.Heeley. Second row: Miss E.M.Allan, Mr Dugald Semple, Mr G.A.Henderson, Miss A.M.Hill, Miss M.Wilkinson, Mrs A.Calder, Mrs G.R.Axon, Miss I.Pederson, Mrs H.H.Jones, Mrs R.Walker with Susan on her knee, Mr Roy Walker, Mrs Mary Wyatt, Mr J.H.Bolt, Mr W.A.Sibly (President), Mr Oluf Egerod, Mrs van Borrendam, Mr J.Hough, Mr T.Latham, Mrs T.Latham, Miss Wlliams, Mrs Marion Reid, Mr John Reid. 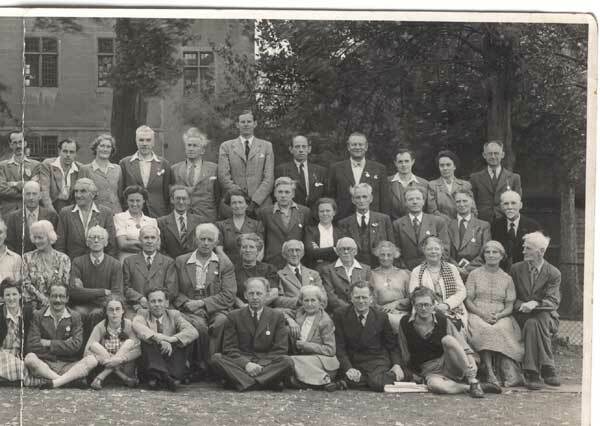 Front row: Dr H.J.Rogler, Mr E.A.Webbe, Mrs V.W.Bricker, Miss D.Reeves, Dr T.Kaayk, Mrs A.Reid, Mr E.M.Vonka, Mrs G.H.Hunter, Mr G.H.Hunter, Miss Valerie Healey, Mr D.Watson, Mr J.J.Kooymans, Mrs S.Taylor, Mr J.A.van Beemen, Mr J.Borovoy.